Another reason for the silence here at my blog: not only was I hard at work on my Ann Grimshaw sampler (now complete), but made together with my quilting friends a quilt for our good friend who's getting married in Paris. This post is therefore post-dated, as our Parisian friend also reads my blog and this quilt had to remain a surprise, even though I really wanted to share this with all of you! As the the three of us live in different parts of the country, it took four weekends of driving quite a few kilometers north, south and east, late-night sleep-overs, and early morning breakfasts to get this accomplished. We moved living room furniture, crawled on floors, fought and won small battles with irons and sewing machines. We could have gotten this done a lot sooner, if it weren't for the fact that we only had one template to cut all the pieces with, so each of us had a task in order to keep things moving along. One would cut, the other laid it down, another would choose and iron fabrics for cutting. When all the pieces were laid out, rows were made and numbered, and I took the quilt home and sewed it together. The next week I returned with the top, and we sandwiched it, and spent until past 2 am in the morning knotting each and every corner. I took the quilt home again, cut and made the binding, popped it into the washer and dryer, and it got that wonderful vintage look we were looking for. I would have loved to quilt it, but since the wedding was planned very quickly, we had to move quickly as well. Oh yes, and then the label...it's still a bit of an after thought for me, making a label, but the day before departure, I managed to get that done as well. This little quilt was made with lots of love and so much laughter - lots of positive energy! It's a large lap quilt, with the basis of muslin, and lots of little scraps of fabric and charm squares from our collection. Many of them are bold bright colors, matching our friend's personality. 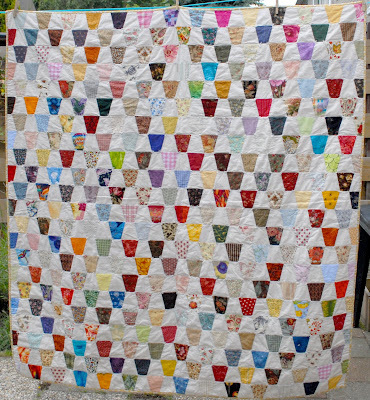 There's lots of fond memories in those scraps, and while making the quilt we shared those stories together. We were so busy, that there were not many photos taken of the process, but you'll get the basic idea. I think I would have to say, this is my favorite part of quilting: stitching down the binding. The quilt is just about done, and you can just sit and stitch snuggled under the quilt. edit: We've returned from a whirlwind weekend of celebration and fun, and the quilt was very well received. Gorgeous quilt! Is this pattern called "Corner Stone"? I love stitching the bindings too. Way too warm here to pull out any of my quilting WIPS...no air-conditioning makes it impossible to have a big heavy blanket on one's lap. Sticking with my cross-stitching for now, but I have a lot planned for the Autumn. I love your tumbler quilt. We are exchanging charm squares in my group to make tumblers. I just think that scrapy quilts are the best.